Download the FLARManager distro from here. 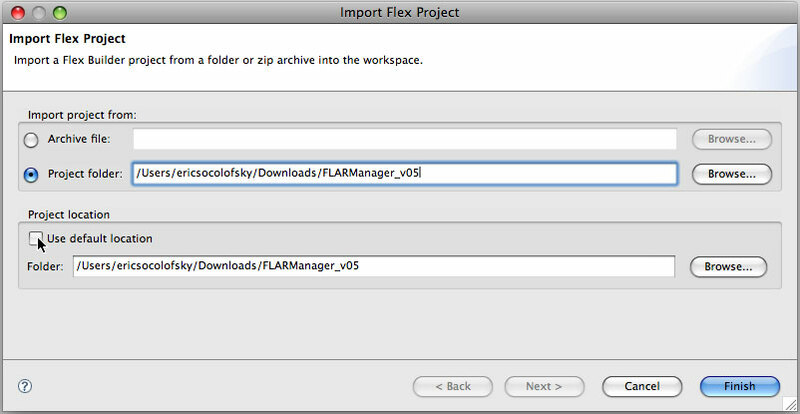 In Flash Builder’s top menu bar, go to File>Import>Flex Project. Select ‘Project folder’ and Browse… to the folder you unzipped the download / checked out the source into; this folder should contain the ‘resources’ and ‘src’ folders, as well as the Flash Builder project files (these are hidden files on OSX). Uncheck ‘Use default location’ — the path you should use is the same path of ‘Project folder’. Take a look at your Problems window (if it’s not visible, select Windows>Problems from the menu bar). If you see anything about ‘Cannot create HTML wrapper…’, right/ctrl-click on that error and select Recreate HTML Templates. Flash Builder will rebuild the project and create your html-template folder. Then, run the project via Run>Debug>FLARManagerExampleLauncher. The default tutorial is FLARManagerExample_Collada.as which will display an animated model resting on your marker. Wait — what marker?? Ah yes, we need to print out the marker to hold in front of the camera. You can find the markers in the FLARManager bundle, inside of /resources/flarToolkit/patterns/. 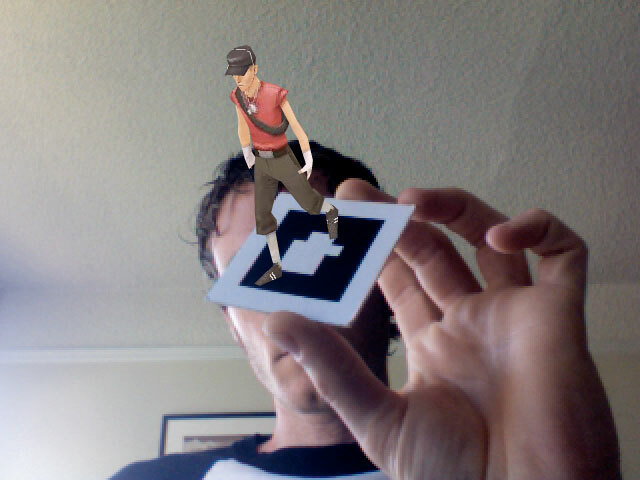 Print any of the .png files within, and hold one in front of your webcam. please post a comment here, and we’ll try to help out. Note: if you’re using flare*tracker or flare*NFT, you must have the .lic license files in the same folder as your swfs. Evaluation versions of the .swc and .lic files for flare*tracker and flare*NFT can be downloaded from Imagination’s site. With the evaluation versions, tracking stops functioning after one minute. Also, you must include the flare* .swc files in the /libs/ folder in order to compile. If you see any errors referring to CLibInit, the flare* .swc files are not on your build path. The following is a loose list of resources we’ll need to build and compile FLARManager applications. 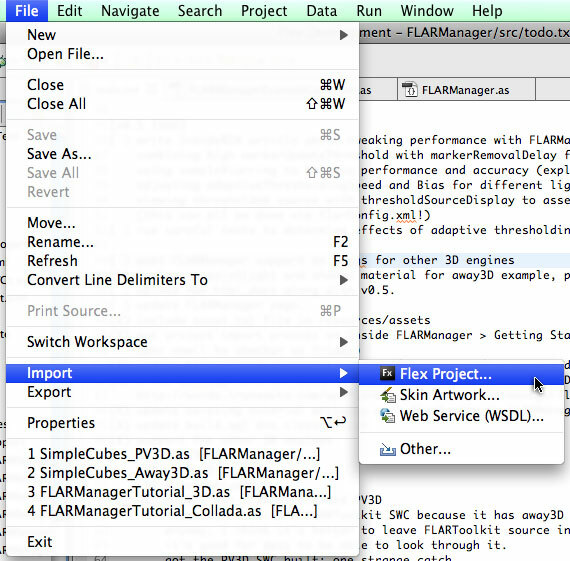 FLARManager runs in Flash Player version 10 or greater. This means we need a text editor and compiler that is able to target Flash Player 10. NOTE: To target Flash Player 10 with Flex Builder, we must have version 3.2 or higher. More information here. Flash Builder targets Flash Player 10 by default. You can download everything from this page. Please be sure to read the information about licensing. FLARManager is free for non-commercial use, and commercial-use licenses are available for a fee via ARToolworks and other resellers. Use of these tracking libraries and 3D frameworks is subject to each of their licenses. Alternatively, if you want to get the freshest versions of all the (open-source) libraries, you can do so from the following links. You’ll need an SVN client to access the latest revisions.